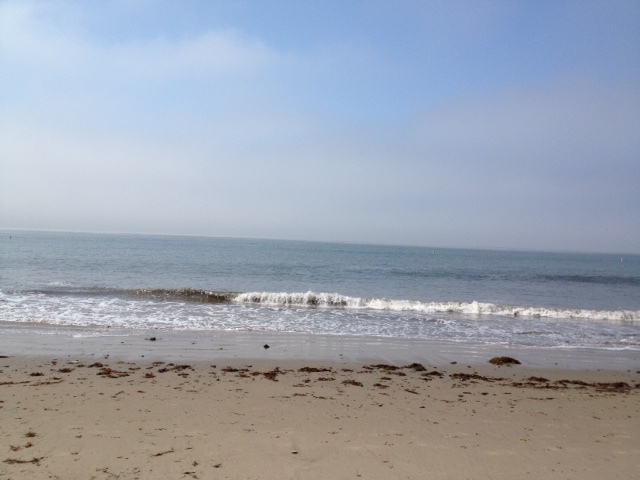 The sunny, sultry days of July and August are often referred to as the “dog days” of summer. Ancient civilizations noticed what they thought was a correlation between the hottest days of summer and the heliacal (or, at sunrise) rising of the star Sirius in the constellation known as Canis Major (the “Big Dog”). Although Sirius does not actually have an effect on the temperature, its heliacal rising does coincide with some of the hottest days of summer in many parts of the northern hemisphere. “Canicular days” (from the Latin word for dog) made their first appearance in print in English in 1398. The Old Farmer’s Almanac puts the timing of the Dog Days as July 3 through August 11. 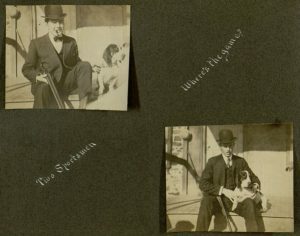 As we sweat our way through the dog days of summer, here is a selection of dog images from our collections! 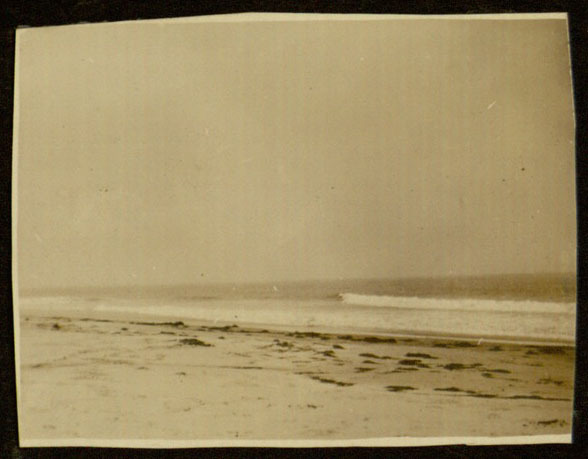 Earlier this year, we digitized a photograph album of Southern California from 1919-1920. 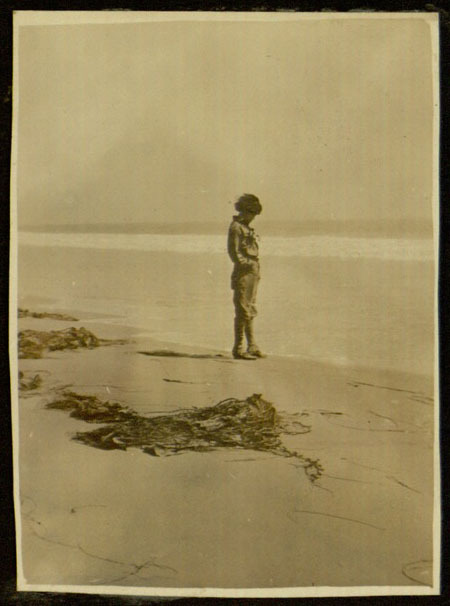 The people in the scrapbook are unidentified, but they did label and date their excursions around Southern California. 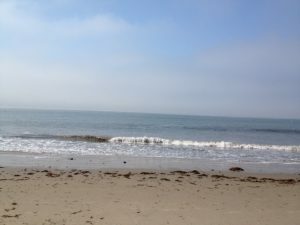 Locations pictured include many places in the greater Los Angeles area and the San Fernando Valley, San Diego, and Santa Barbara. Santa Barbara happens to be my hometown and I love taking then & now photographs (previously: Paris and the USA), so I took some comparison shots while I was home on vacation in June. 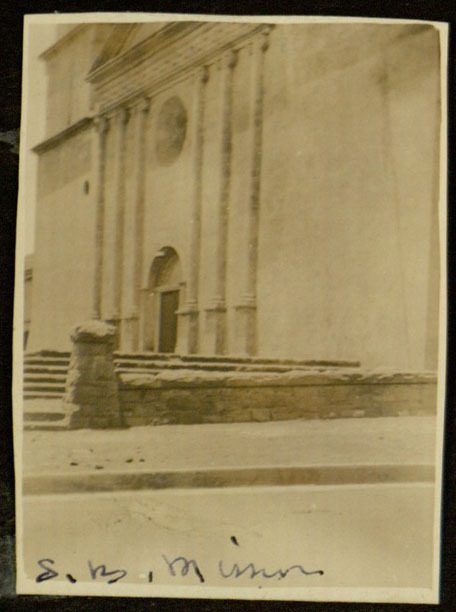 The people in the photo album took their trip to Santa Barbara in 1919, so these photos are 97 years apart. 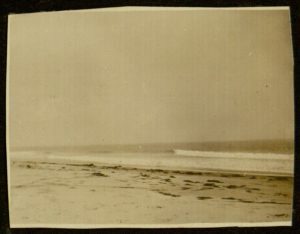 Wave coming in to shore, 1919. Wave coming in to shore, 2016. 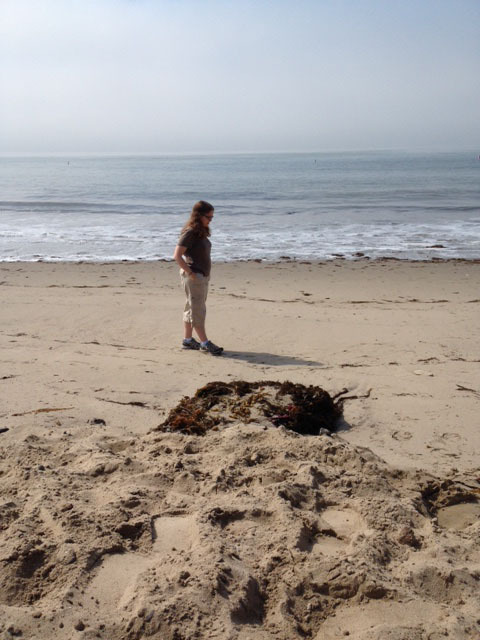 There were no distinguishable landmarks on the 1919 beach, so I chose Goleta Beach, near my parents’ house. 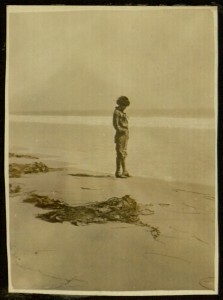 Unidentified woman with kelp, 1919. Unidentified woman and man, 1919. Liz and David, 2016. 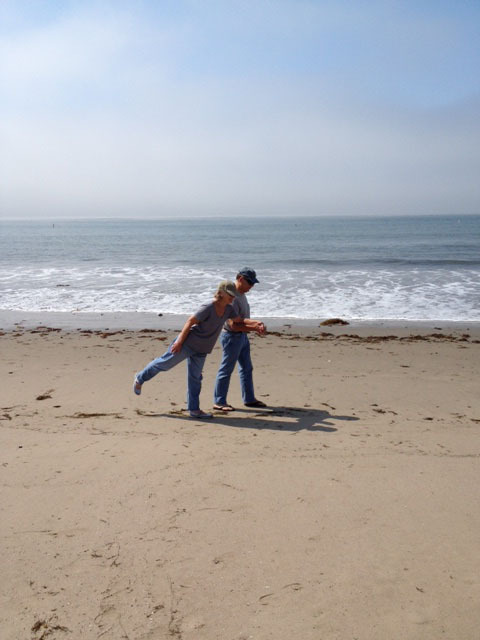 My parents joined in on the photo recreating fun! 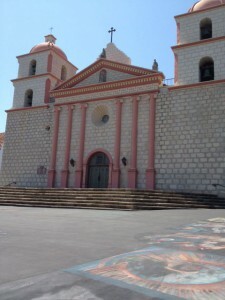 Because they cut off the height of the Mission, I also took a broader view of the facade, 2016. War is “months of boredom punctuated by moments of terror.” (Letter to the London Times, November 1914) How do thousands of young men, with little to entertain them, break up the tedium? During the Great War, the extreme monotony of trench warfare combined with a relatively new and plentiful source of material, in the form of brass cartridges, led to a boom in creativity. Soldiers produced prodigious amounts of art by carving bones, melting aluminum and casting it in the mud, or pounding out items from expended brass. A Canadian soldier crafted an entire tea set for his mother from shell casings. 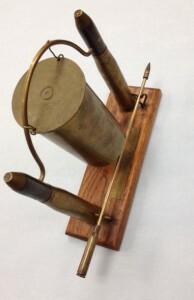 Trench art includes items made from found objects by soldiers, sailors, POWs, and civilians at the front, behind the lines, in hospitals, or at home. The term originated with World War I, but armed forces throughout history have created art. Any surface was liable to be decorated. The paintings on airplane fuselages are a very visible and popular form of art from World War II. Currently on exhibit on the first floor of Falvey Library is an embellished World War II duffel bag from our Reap collection. As seen in National Geographic, soldiers in World War I created amazing graffiti in the caves, quarries, and wine cellars of France and Belgium. No simple “Kilroy was here,” these carvings were elaborate and painstakingly carved symbols, relief sculptures, and memorials. A trench art mess gong fashioned from three different sized cartridges ornaments Villanova’s Special Collections library. indicating that it was most likely created by British or Commonwealth troops for the non-commissioned officer’s dining facilities. American troops traditionally had only an officers’ and an enlisted men’s mess. Beyond art’s function as record or monument, we do not normally link it with war. Yet, like diaries, letters home, or scrapbooks, art can be an expression of memory, history, and collective experience. 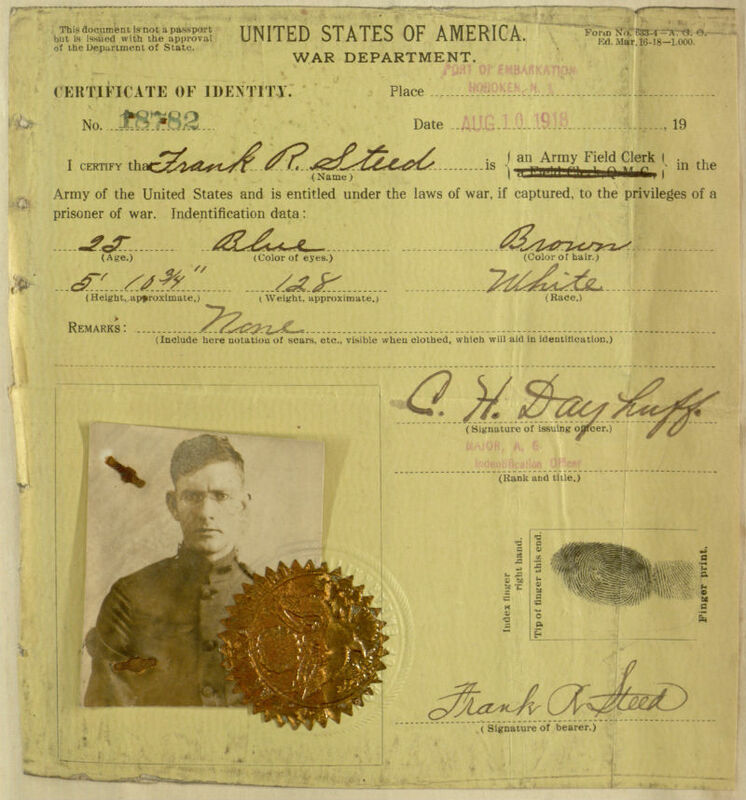 As such, it is an important part of the war record and a valuable connection. 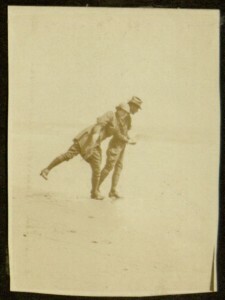 Trench art provided, and continues to provide, an escape from ennui, an outlet for emotion, and mental exercise for soldiers under extreme conditions and far from home. We are in the depths of winter in the Northeastern U.S., so now seems like a good time to recall my summer vacation. Last June, I finished the digitization and description of a two-volume set of scrapbooks kept by one Frank R. Steed, an Army Field Clerk in the American Expeditionary Forces stationed in Paris during the end of World War I. 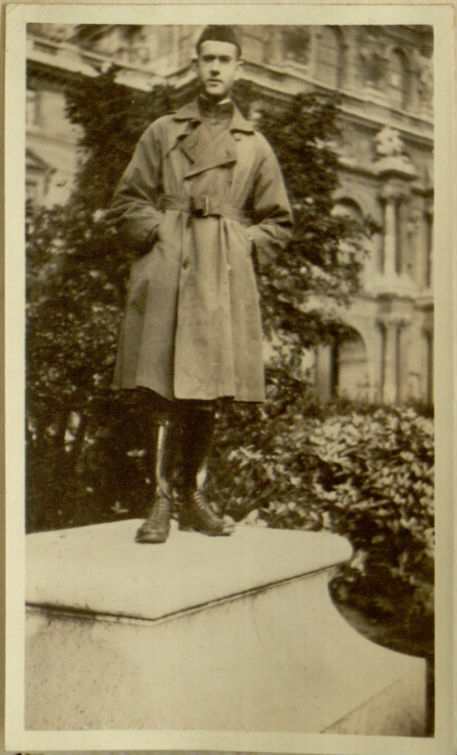 After spending so much time going through the scrapbooks, I felt some fondness for Steed, who arrived in France only two months before the end of the war and stayed until November 1919. His scrapbooks contain memos and other documents relating to his military service, but the majority of items relate to his leisure activities, which included attending dances, seeing numerous theatre productions, and taking plenty of photographs of the cities he visited, including Paris. We recently acquired a 2-volume set of scrapbooks created by Frank R. Steed, an Army Field Clerk in World War I. Both volumes have now been digitized and there are many interesting things to be found within the pages. The materials are not affixed to pages in chronological order, but dates noted range from May 1918 to November 1919. In addition, Steed was inconsistent with his labeling of materials, so there will be several pages with very detailed descriptions written in followed by a run of pages with no notes at all. 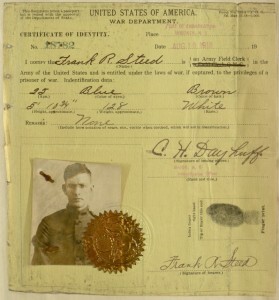 Steed’s Certificate of Identity, issued in August 1918. Steed posing as a statue on an empty pedestal in the Jardin des Tuileries. Despite (or perhaps because of) the dismal nature of his job in the Casualties Division, Steed seems to have had a grand time in Paris and other French towns, as well as several other cities of Western Europe, including Brussels, London, and Dublin. 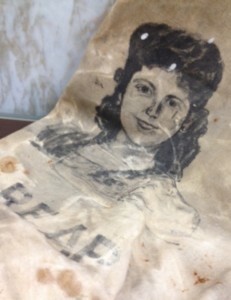 The scrapbooks contain numerous photographs, postcards, programs, documents, menus, tickets, maps, tourist brochures, and even a few pen and pencil drawings. There is a lot to see and these bits of ephemera provide a fascinating glimpse back at Western European culture towards the end of and immediately after the Great War. There are also many postcards and notes from Steed’s friends and family and I am looking forward to looking at those more closely in the future. Scrapbooks (and other types of hand-written/hand-made documents) are among the greatest pleasures of special collections and archives. Scrapbooks are especially challenging to digitize as there is no way to fully replicate the layers of paper and random objects (such as a bit of yarn or a toothpick) in digital form. Adding the metadata to these records was tedious, but I’m glad that we are able to share at least an approximation of these fascinating volumes. I hope that many more people will now have the pleasure of spending some time with Frank R. Steed in WWI Europe. It’s a bit like time travel, being able to share a personal perspective of life and events from almost 100 years ago. 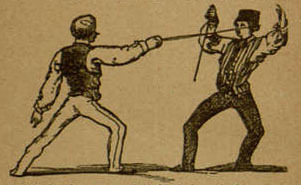 The London Olympics officially open tonight and just this week we’ve digitized a short book on fencing and other sports. The lengthy title of this book seems like it’s in inverse proportion to its diminutive size: How to Fence: containing full instruction for fencing and the use of the broadsword also instruction in archery, described with twenty-one practical illustrations. A complete book. And that’s not even all there is in the book! At just about 60 pages, this “complete book” includes instructions for fencing (p. 5), archery (p. 43), hurdle racing (p. 57), pole-vaulting (p. 58), hammer throwing (p. 59), and shot put (p. 60). The “practical illustrations” only appear in the fencing section, however, so you must use your imagination for the other sports (or perhaps watch some Olympic athletes in the next few days). This book was part of a collection of extremely fragile late-19th- and early-20th-century publications that we recently found in a forgotten corner of the library basement, where they would have been destined for the trash if we hadn’t saved them. Many of these publications are extremely rare and have not been digitized elsewhere, so we are excited to be preserving and sharing them. Among these books are short plays, humorous anecdotes, and “dime novels.” We’ll be posting more about some of these titles as we digitize them and Demian will be adding some to our ongoing Project Gutenberg proofreading project, so stay tuned for more! P.S. : For more Olympic spirit, you can read about Villanova athletes in the Olympics in our digitized collection of The Villanovan. For instance, in the 1956 Summer Olympic Games, held in Australia from November 22 to December 8, two Nova track stars (Charley Jenkins and Ron Delany) brought home 3 gold medals — making Villanova track coach “Jumbo” Jim Elliott “the first American college coach to produce two Olympic winners” (p. 1). 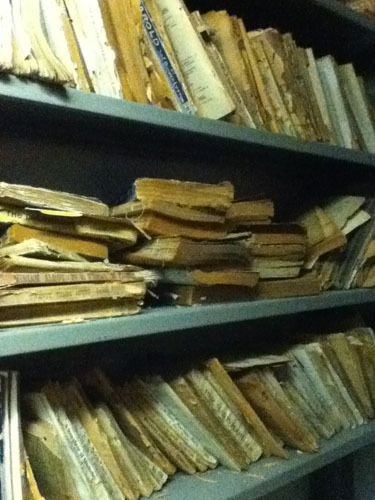 You can find more articles by searching the Digital Library’s Villanovan collection. 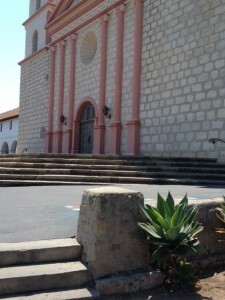 Posted for: Karla Irwin, Villanova University. When I was presented with the opportunity to curate an online exhibition as the Fall 2011 Digital Library Intern I jumped at the chance. 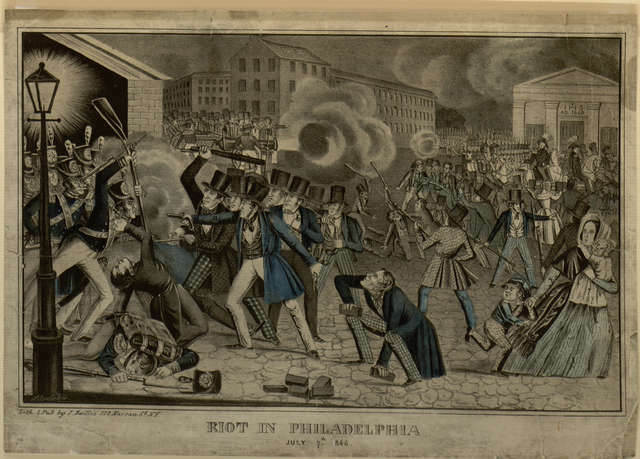 Through the course of my internship I had grown more familiar with the wealth of materials in the Digital Library and I was eager to explore one area in particular: materials related to rioting that occurred in Philadelphia in 1844. Before seeing the items I knew nothing about the riots which was surprising to me because I had grown up in the area and lived in Philadelphia for a number of years. After conducting a little more research I was amazed at the history of the riots and wondered how many people in the area were like me and unaware that the riots had happened. 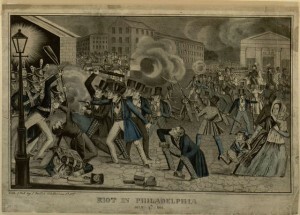 I thought the story of the riots were an important one to share and now it is my pleasure to present to you Chaos in the Streets: The Philadelphia Riots of 1844. 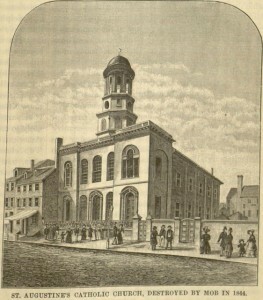 Philadelphia in 1844 was a hotbed of religious and ethnic prejudice, most notably toward Catholics and the Irish. This was representative of a national sentiment and the exhibition looks at a group called the Nativists, who later became the Know Nothing Party, and their role in the rioting. In May and July of 1844 these issues came to a breaking point and the city of Philadelphia saw some of its most violent days in her history. The riots would ultimately have many lasting effects and it can be said that the Philadelphia you see today is partially a result of those violent days. The Digital Library provides access to quite a large collection relating to the riots including a collection of letters from Morton McMichael who was the sheriff at the time. His letters and personal journal provide a first-hand account of what it was to be like on the streets of Philadelphia in the mid 1840’s. 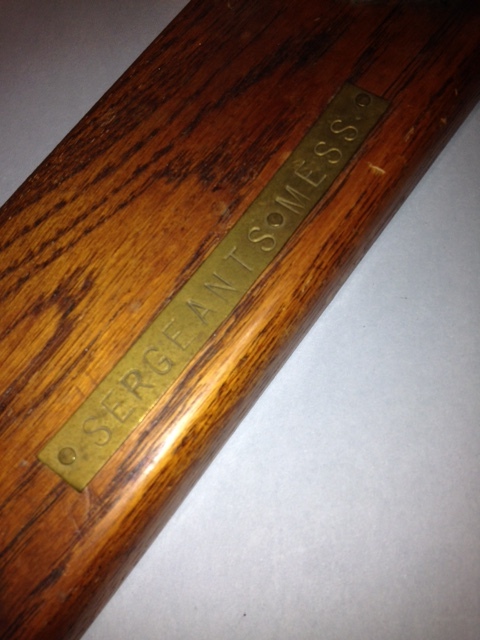 Only a small portion of his entire collection is utilized in the exhibit and so I recommend taking a longer look at the letters as they offer a fascinating window into policing in Philadelphia during that time. There was no shortage of interesting material on the riots but one aspect that proved especially dramatic to me was the role the Catholic Churches had in the rioting, particularly St. Augustine’s Church. I had visited the church many years ago in the Old City section of Philadelphia and walked by it countless times. What I did not know is that the St. Augustine’s I saw today was rebuilt from the one that had burned down during the rioting. Sadly, along with the burning of the church, a library containing an invaluable collection of theological materials was also destroyed. Imagine my amazement when I found out some of the books from that library ended up in Special Collections in Falvey Library! You will find in the exhibition how the Augustinian community in Philadelphia put major roots down in both center city Philadelphia and, of course, Villanova University. I hope you find the connection, and how it relates to the riots, as interesting as I do. Finally, I would like to thank Michael Foight and Laura Bang for their valuable guidance, Joanne Quinn for the graphics, Susan Connor, Susan Ottignon, and Chelsea Payne for their informative transcription work, and David Lacy for his work on technical details. Without them the exhibition would never have come to fruition. 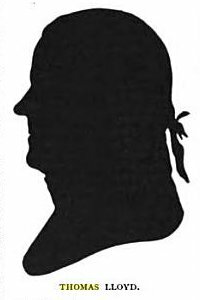 A View from Behind Bars: The Diary of Thomas Lloyd, Revolutionary and Father of American Shorthand, from Newgate Prison 1794-1796. 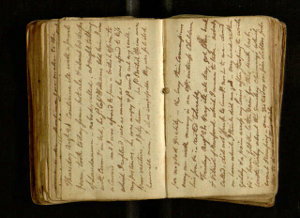 One of the more interesting and unique items in the Falvey Memorial Library Digital Collection is the diary of Thomas Lloyd (1756–1827) – teacher, stenographer, soldier in the American Revolutionary War and “Father of American Shorthand”. The diary covers the latter half of Lloyd’s incarceration time in London, first at Fleet Prison for debt and later at Newgate Prison for seditious libel against the British government. 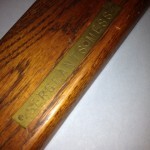 This item is part of the Lloyd Collection, a subcollection of the American Catholic Historical Society collection hosted at the Villanova University Digital Library. Born August 14th, 1756 to William and Hannah Biddle Lloyd, Thomas Lloyd first studied shorthand in what is now modern day Belgium at the College of St. Omar. Shortly after, Lloyd immigrated to America right before the outbreak of the American Revolutionary War, where he joined the war effort as part of the Maryland Militia Fifth Independent Company. Later, as part of the Maryland Regiment Fourth Company, he was wounded and captured at the Battle of Brandywine (which took place a short drive from Villanova University’s campus). After the war (he was released in a prisoner exchange, recovered in a hospital in Lancaster, PA, and later discharged from the army in 1779), Lloyd used his shorthand skills to record the debates of the Pennsylvania Assembly. Starting in 1787, this work included recording and publishing the debates of the Pennsylvanian Convention to ratify the United States Constitution. This job led to both note and notoriety, as Thomas Lloyd’s pro-ratification stance was well-known, and reports and rumors abounded of Lloyd taking bribes to help the pro-ratification side. Although Lloyd recorded both pro-ratification and anti-ratification stances, both for the Maryland and Pennsylvanian delegation, the bulk of the speeches that were published were almost always of the pro-ratification kind. Eventually, with the Constitution ratified, Thomas Lloyd attended the First Federal Congress with the goal of recording the entirety of the debates — this job became official when Lloyd was appointed official recorder of the second session of the House of Representatives. The works of Thomas Lloyd during this period, including his notes and published articles, are considered the most accurate representations of the goings-on of Congress during this historic portion of American history. 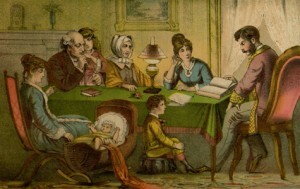 Visiting family members in London in 1791, he stayed on to help with his father’s business. During his time in London, his desire to familiarize Londoners with the new Republic and its systems led Lloyd to publish “The Commentaries on the Constitution of the United States of America, with the Constitution prefixt” in 1792. Unfortunately, Lloyd also ran into financial difficulties (his London agent failed to make good on his agreements), and Lloyd was arrested and incarcerated in Fleet Prison in London for debt. While in Fleet Prison, Thomas Lloyd was charged with seditious libel against the British government for posting a placard containing a “declaration of republican principles” on a chapel door. Found guilty, he was sentenced to one hour in the pillory, fined five thousand dollars, and received a three year sentence in Newgate Prison. It was during his prison stay that Lloyd, along with Mathew Carey, a friend and prominent publisher/employee of the Pennsylvania Herald, published “The System of Shorthand Practiced by Thomas Lloyd in Taking Down the Debates of Congress and Now (With His Permission) Published for General Use”. It was this work that made Thomas Lloyd famous for his shorthand style. Looking for a cure for an ulcer? During his time in Newgate Prison, Lloyd kept a diary with near-daily entries on every topic from daily prison life to recipes for medicines to shipping manifests and prices of various goods. The diary reads less like a typical journal of events and thoughts and more like a batch of notes lying haphazard on a desk (or rather more like an engineer’s notepad). This gives the impression the diary wasn’t intended to be published, but rather used as a collection of random notes for things to be remembered in the short-term for later use. 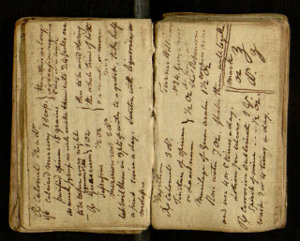 An example of this can be seen starting on page 9, where Lloyd, rather than using the space for daily events, lists several recipes in his diary, including some medicinal ones. An example on page 11 has a treatment for ulcers – Lloyd had complained of being ill on several previous pages, which might be the impetus for this entry. As well, entries are written both vertically and horizontally on the page, with numerous scratch-outs, inserts and margin notes. The haphazard style of the diary, while making the pages harder to read, gives the diary the advantage of authenticity – the chance to read the thoughts and notes of someone before they got too heavily filtered for the general public. In addition, the various topics and notes give a more complete picture of the time period and the daily comings-and-goings of both the prison and the outside world. An interesting item from the diary to those unfamiliar with London prisons is the sheer amount of visitors who call on Thomas Lloyd during his incarceration — it seems like he gets at least one, if not two, visits a day, mostly on either business or legal reasons. These visitors often dine with Lloyd as well. Visits occur frequently enough that Lloyd often makes note of the days without visitors (as well as recording his tendency to get despondent on those days). This is due to the two-tier prison system common in 1790s London – commoners are housed in one section of the prison and have little rights and privileges, whereas more upscale citizens (or at least those with money) are housed in a separate section of the prison and given leeway to have visitors, conduct business, and on occasion even live outside the prison walls. According to the information contained in the diary, Thomas Lloyd is definitely in the latter group. This of course isn’t to say Lloyd had an easy life in prison – on the contrary, as early as page one Lloyd complains of being assaulted by fellow prisoners as well as being very ill. Lloyd often records not being well over the two years covered in his diary, suggesting that prison sanitation may not be all that great, or that stress was getting the better of his immune system. My own hypothesis on this is that it’s a bit of both. For historians, lots of historical references are peppered throughout the diary. Two examples: page 171 of the diary notes that Friday, September 11th was the 18th anniversary of the Battle of Brandywine (where Lloyd was wounded and captured by the British) and page 93 has a note on receiving news of the death of Robespierre, the famous figure of the French Revolution (as well as some opinions on the man and his ideals). On a lighter note, head over to page 97, where Lloyd records taking 30 drops of Laudanum (read: opium) for his fever, which may have contributed to his declaration that a British officer “was afraid to kiss [his] posterior” later in the entry. For those interested in shorthand, the diary has numerous examples of shorthand notation. A good example can be seen on page 107 where Lloyd shortens words that end in “-ought” with “ot”. Lloyd was also known to remove vowels from words in his shorthand, like the word “said” with “s.d”, also seen on page 107. 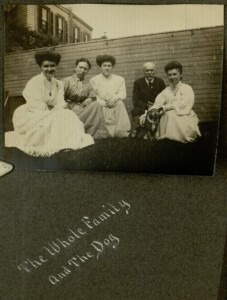 You can see the diary for yourself, as well as obtain a transcript here in the Digital Library. “Debtors’ Prison” Wikipedia: The Free Encyclopedia. Wikimedia Foundation, Inc. 2 April 2011 Web. Apr 2011. National Shorthand Reporters Association. “Unveiling the Lloyd Memorial Tablet” The National Shorthand Report Vol. 1 No. 9. 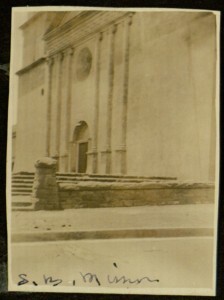 Sept 1903. Google Books. Web. Apr 2011. “Newgate Prison” Wikipedia: The Free Encyclopedia. Wikimedia Foundation, Inc. 10 April 2011 Web. Apr 2011. “Thomas Lloyd (stenographer)” Wikipedia: The Free Encyclopedia. Wikimedia Foundation, Inc. 21 November 2010. Web. Mar 2010. “Thomas Lloyd commonplace book, 1789-1796 Notes” American Philosophical Society. Web. Mar 2010. March is Women’s History Month in the United States, so here are a few interesting titles on the topic. These titles are part of an exhibit on the first floor of the library, on display until the end of the month, and they are all available online through our Digital Library or the Internet Archive. 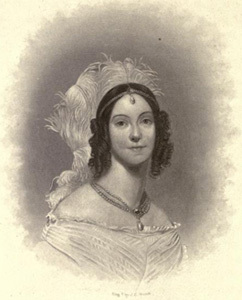 Angelica Van Buren, from "The Ladies of the White House." The ladies of the White House; or, In the home of the presidents: being a complete history of the social and domestic lives of the presidents from Washington to the present time—1789-1881 by Laura C. Holloway (Philadelphia: Bradley & Co., 1881) provides one of the first collective biographies of the First Ladies of the United States. “Without the effective and intelligent aid they rendered,” Holloway writes in her introduction, “no administration would have been satisfactory; and though the political historian may ignore such service, the right-thinking, honorable men or women of this country have a higher appreciation of the services rendered by these ladies, who were the power behind the throne, equal in social influence to the throne itself, and a historical work bearing upon their lives is a valuable contribution to the nation’s official history.” This work was published in several editions; the 1881 edition includes the First Ladies from Martha Washington through Lucretia Rudolph Garfield. For more information about the history of the First Ladies of the United States, see this article on Wikipedia or this up-to-date list of brief biographies on the White House website. For an interesting look at nineteenth-century domestic life, be sure to check out The complete home: an encyclopedia of domestic life and affairs … by Mrs. Julia McNair Wright (Philadelphia: J. C. McCurdy & Co., 1879). These tips and tricks are narrated by “Aunt Sophronia” to her three young nieces. Be sure to check out the illustrations! (The Internet Archive scans do not do them justice, so we have included our own scans of the illustrations in our Image Collection.) In the years following the U.S. Civil War, domestic bliss was seen as the nation’s saving grace after the loss of so many lives. In addition, women’s active role in the abolitionist movement came to an end with the passing of the 15th Amendment and women themselves became the topic of debate, with some parties arguing that women belonged in traditional domestic roles and others arguing that women should be allowed to participate more freely in non-traditional arenas. Modern Home, from "The Complete Home..."
On that note, the Proceedings of the Twenty-fifth Annual Convention of the National American Woman Suffrage Association, held in Washington, D.C., January 16, 17, 18, 19, 1893 edited by Harriet Taylor Upton (Washington, D.C.: The Association, 1893) gives a different perspective of nineteenth-century life, when women were still fighting for the right to vote. We often take our voting rights for granted these days, so it is important to look back at the history of women’s suffrage. The National American Woman Suffrage Association (NAWSA) was formed in 1890 as a result of the merger of the National Woman Suffrage Association and the American Woman Suffrage Association, both of which were founded in 1869. It took 51 years from the initial creation of those two groups until women’s suffrage was finally achieved when the 19th Amendment became law in August of 1920, less than 100 years ago. For more on the history of the NAWSA and the path to women’s suffrage, check out this site, part of an online exhibit from the Bryn Mawr College Library. Speaking of Bryn Mawr, another interesting book is A Book of Bryn Mawr stories edited by Margaretta Morris and Louise Buffum Congdon (Philadelphia: George W. Jacobs and Company, 1901). I am a 2005 alumna of Bryn Mawr College, so I couldn’t resist giving them a mention during Women’s History Month. Founded in 1885, Bryn Mawr College was not the first women’s college in the United States, but it was the first to offer undergraduate education on par with that of the top men’s colleges. The College sought to provide women with intellectual challenges and give them the opportunity to conduct original research, “a European-style program that was then available only at a few elite institutions for men.” It was also the first institute of higher education to grant graduate degrees (including doctorates) to women. In 1892, Bryn Mawr founded the first self-government association, granting its students the right to make and enforce the rules governing their conduct. From its inception, Bryn Mawr College strove to overcome the nineteenth-century notion that women were not the intellectual equals of men. This collection of “Bryn Mawr stories” marked the first truly introspective look at the College. Although fictional, the stories provide early glimpses of the unique characteristics of Bryn Mawr. Interesting aspects of women’s history turn up in many areas of our Digital Library, so be sure to take a look around. In particular, check out the correspondence of the Sherman-Thackara families or the Barry-Hayes Papers for love letters and domestic matters, primarily from the 19th-century, or the Handbook for the Women’s Army Auxiliary Corps, Fort Des Moines, Iowa (1943). Black History is not a particular focus of our Special Collections department, but we do have a few noteworthy items with which I was able to put together a small exhibit on the first floor of the library. Only one of these books is available in our Digital Library, but the others are available through the Internet Archive. Here, then, is a brief look at some of these historically interesting books. The portrait gallery of pugilists of America and their contemporaries by Billy Edwards (Philadelphia: Pugilistic Pub. Co., 1894) profiles many of the noteworthy boxers of the late nineteenth century. Although the majority of pugilists included in the book are white, the book gives a good view of the racial tensions in boxing at the end of the nineteenth century. 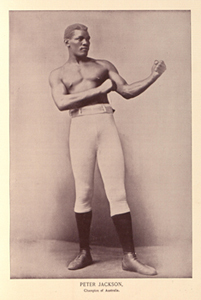 One of the black boxers profiled in the book is Peter “Black Prince” Jackson (1861-1901). The descendant of a freed slave, he was an Australian heavyweight boxer who had a significant international career, although the Australian Dictionary of Biography Online notes that “Jackson was one of the finest boxers never to fight for a world championship: John Sullivan refused to defend his title against a black and [James J.] Corbett avoided Jackson once he gained the heavyweight crown in 1892.” For more on Jackson’s career as “a black fighter in a white world,” see the full article here. Hampton and its students by two of its teachers, Mrs. M.F. Armstrong and Helen W. Ludlow (New York: G. P. Putnam, 1875), tells of the founding of the Hampton Normal and Agricultural Institute in 1868, shortly after the conclusion of the U.S. Civil War, by black and white leaders of the American Missionary Association. The roots of this school went back further, however, to a “simple oak tree” on a former plantation that served as a gathering place for former slaves who sought refuge there with the Union Army in 1861. One of the school’s earliest students was Booker T. Washington, who arrived in 1872 at the age of 16, and later became a renowned educator and author. Hampton Normal and Agricultural Institute shortened its name in 1930 to Hampton Institute, and in 1984 it was accredited as Hampton University. 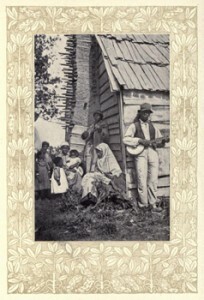 Photo illustration from "Poems of Cabin and Field." Poems of cabin and field by Paul Laurence Dunbar (New York: Dodd, Mead & Co., 1900) includes poems in dialect by Dunbar paired with photographs from the Hampton Institute camera club. Dunbar was the first African American poet to win national acclaim. He was born in Dayton, Ohio, in 1872, to former slaves. Dunbar’s work included poems in dialect as well as standard English, essays, short stories, and novels. His work often described the difficulties faced by African Americans as they tried to achieve equality. To read more about Dunbar’s life and work, see the University of Dayton’s Paul Laurence Dunbar Website. Uncle Tom’s Cabin by Harriet Beecher Stowe (Cleveland: J. P. Jewett & Company, 1852) is one of the most widely-known novels about slavery. Published in 1852, this novel focuses on the character of Uncle Tom, a long-suffering slave, around whom the other characters’ stories revolve. The novel portrays the reality of slavery while also emphasizing that Christian love can overcome anything, even the enslavement of fellow human beings. Uncle Tom’s Cabin was the best-selling novel of the nineteenth century, selling 300,000 copies in the United States in its first year of publication. The novel was heavily criticized by those who supported slavery, especially in the South, while it received praise from abolitionists. In response to such negative criticism, Stowe produced A Key to Uncle Tom’s Cabin (Boston: J. P. Jewett & Co., 1853) one year after Uncle Tom’s Cabin. Stowe maintained that she based her novel on the stories of fugitive slaves she encountered in Ohio. This book was also a best-seller. Uncle Remus, his songs and his sayings: the folk-lore of the old plantation by Joel Chandler Harris (New York: D. Appleton and Company, 1881) was a collection of animal stories, songs, and other forms of oral folklore that were compiled into written form by Harris, who remembered hearing them from slaves while he worked on a plantation as a young man. The stories are rendered in Harris’s version of a Deep South slave dialect. Br’er Rabbit is the main character of many of the stories. He is a trickster, often getting himself into scrapes with Br’er Fox and Br’er Bear. The stories often convey a lesson, much like Aesop’s Fables. Both Harriet Beecher Stowe and Joel Chandler Harris were white Americans who wrote stories about African Americans and slavery. First published in the latter half of the nineteenth century, both authors were praised by their contemporaries for the accuracy of their depiction of African Americans in what was then considered to be a non-racist manner. Although attitudes have changed since then and the stereotypes and dialects of the stories are now deemed offensive, Stowe and Harris both remain important and influential figures. Stowe’s work helped to fuel the abolitionist cause and, according to some, was also an influence leading up to the Civil War. Harris’s Uncle Remus tales were an accurate recording of tales told by slaves, which helped to preserve their folklore for future generations.